By the time most of you read this it will already be Saturday, June 13, 2015 and our great friend, Dave Snowden, will offically be retired as the Chief of Police for the Beverly Hills Police Department, ending - to the precise day - a 49-year law enforcement career. He hoped to stick it out to a nice round "50", but life intervened and his recent back surgery accelerated his decision. With his permission, I've posted the letter he wrote earlier today on Facebook describing his career and his feelings upon retirement. Please take a minute to read it. Tomorrow, June 13th, I will be retired. 49 years to the day from when I was sworn in as a police officer in my home town of Montebello. I wanted to make it an even 50 years, but my doctor had a different opinion after my recent back surgery. Well, I have had quite a run, having served with four great agencies (Montebello-1966-1977, Baldwin Park-1977-1986, Costa Mesa-1986-2003 and Beverly Hills-2004-2015). I was first appointed chief (Baldwin Park) on November 1, 1980. All of this time my beautiful wife Ellyn has been by my side and supported both me and the communities we have served. I met her when I was, an officer in Montebello, which is also Ellyn's home town, 44 years ago. Ellyn is amazing and has received volunteer awards every year for her work with various causes in BH. I wish we could do it all to do over again. I have served with the finest and most dedicated people in the business during my career. I feel very proud of the great protection we have provided to the communities in which I have been privileged to serve. I am also proud to have watched many people that I have hired over the years succeed in their careers.. Some have even become chiefs themselves. I salute them all and thank them for their service. Sadly and most regrettably, I have lost three great officers in the line of duty on my watch: Dave Ketchum, Mike Libolt and Gabe Coyoca. They will never be forgotten and I think of their sacrifice daily. I am proud to say I hired Gabe twice. First at CMPD and later BHPD. I am very proud of BHPD. Among so many accomplishments, we have the lowest crime rate in the region, a consistent response time for the past 11 years of under 3 minutes and some of the best technology available is now operational. All of this in a city with 127 sworn officers and daily population estimated at 295,000. BHPD does a fantastic job of keeping our city safe! There will be a City Council recognition for me Tuesday evening at 7:00 PM at the Beverly Hills City Hall and a retirement party is being planned for early August. I hope to see you all there. More info to follow. Thank you for your support and your friendship. 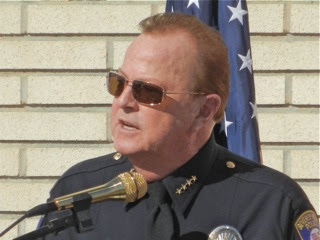 During his tenure as Chief of Police for Costa Mesa Dave was an extremely effective leader. Many of the men and women he hired are still with the department and form the solid core of the organization. 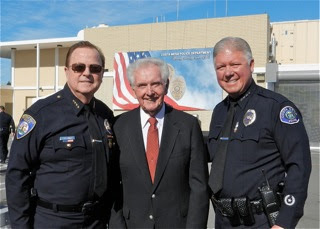 He took the organization that Roger Neth, shown here with Dave and former Chief Tom Gazsi, built with such care and expanded and refined it and helped make it one of the premiere law enforcement organizations in the state. For that, the residents of this city should be eternally thankful. You will always be remembered as a great Chief in this town. But, what can one say? More roads to travel, many more sunrises and sunsets to experience, many footprints to leave. I hope you will be able to enjoy everyone of them. 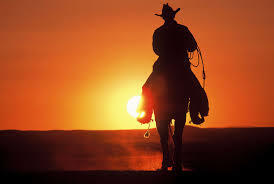 Happy Trails to YOU! Dave Snowden was effective and a good leader. We were cutting edge in so many of our public safety policies and programs and under him had a culture of pride and a practice of preventive policing ( community policing model, Able, effective, fully staffed special units, etc.) Management and city councils were supportive of the sworn and non-sworn personnel that made up the network of safety that protected Costa Mesa and made in unattractive to criminals. Snowden was so competent he made it look easy, a real class act. May God bless him as he leaves this great legacy in costa Mesa and Beverly Hills for what I hope will be a rich and fulfilling future.